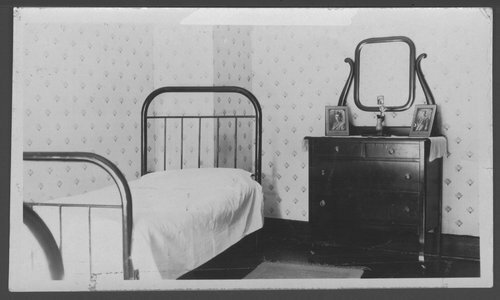 This photograph shows a child's bedroom in the 'old' Southard School. This was the first children's division at the Menninger Clinic, Topeka. In 1926, the Menninger Clinic established the Southard School for children. The school fostered treatment programs for children and adolescents that were recognized worldwide. This photograph shows a child's bedroom in the 'old' Southard School. This was the first children's division at the Menninger Clinic, Topeka. In 1926, the Menninger Clinic established the Southard School for children. The school fostered treatment programs for children and adolescents that were recognized worldwide.